i have been home for days off for nearly two weeks now but had to stay at the house due to a bad infection i suffered. i’m still thankful though that it happened here while i’m home and not where i work. good thing i’m better now for my flight for my first “lone backpacking” will be this coming week. so where am i going? i’m going to have a week visit to – malaysia. my initial plan is to visit three key places of malaysia namely, kota kinabalu, penang, and kuala lumpur which will be my last stop. i have researched a little about spots to visit in kota kinabalu and kuala lumpur and will just maximize the limited time i have but not to the point of stressing myself out for i want this to be a leisurely trip. i have not planned anything on penang for my doctor-bestfriend-instant tour guide, docgelo has everything organized for me, hehe. my transportation will all be by air (cebupac and air asia) and accommodations have been pre-booked to avoid the hassle of looking for a place to stay. travelling alone is not new for me and getting lost is a usual thing i always experience! i get lost in airports looking for gate numbers, i hate trains for i jump out on the wrong station and i am a magnet for cab drivers who are total asses. i have this habit of asking about three or more persons on directions for i am very poor on reading signs and notices, lol! anyway, i’ll just do this and have fun and stay safe. 🙂 _________________________________________________________________________________________________ i have received four entries for my bloggy blog contest. thank you for joining – docgelo, chyng, kg and pm. and the winner of the mini travel speakers is.. prinsesa musang for her post “what to do in an orthopedic clinic“. she deserves to win out of the endless purring i got from her that she should be the winner, hehe. congrats pm, i’ll send you an e-mail for your contact details, will send your prize through courier. of course the three bloggers who joined also have something from me. i just revisited monasterio de tarlac yesterday and got these beautiful scented red beads rosaries. docgelo, chyng and kg will have one. 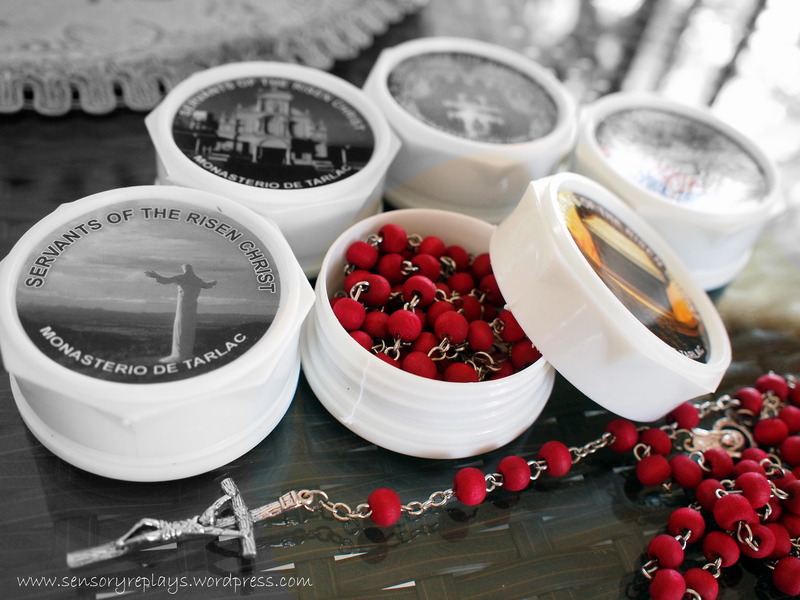 This entry was posted in random and tagged blog contest, lone travelling, rosaries from monasterio de tarlac. Bookmark the permalink. omg, it looks exactly the same as my rosary which I lost last year! .. really? ayan meron ka na uli to bring with you when you travel. see you doc! oo treat ko sa hawkers, hehe! thanks for the rosary rob! .. you’re welcome grace! i’ll personally say ‘hello from grace” for you to doc. .. got your details, thanks. talagang aggressive ka sa listahan mo ha, have fun sa malaysia, siguradong magkikita kayo ni docgelo. sa susunod sama ko ha? haha. .. congrats again pm! got your details, thanks. .. hmm oo, dalawa agad di ba? hehe. .. hehe, enjoy your new speakers pm! .. i will bert, thank you! .. exactly the same places! thanks claire! i think it pays to prebook all travel accommodations. saves time and hassle while traveling. good luck and enjoy this solo backpacking adventure.